It's been one week since we celebrated our five year anniversary. I can't believe it's been five years. Five great years. Five years since our family and friends so generously traveled to spend our special day with us. Five years of so much change. New jobs, a new house shortly after we were married, a new truck (thanks to E. J. 's truck catching on fire nearly five years ago - we like to keep it interesting, I guess), and of course the greatest new addition that made us a family: Kathryn. 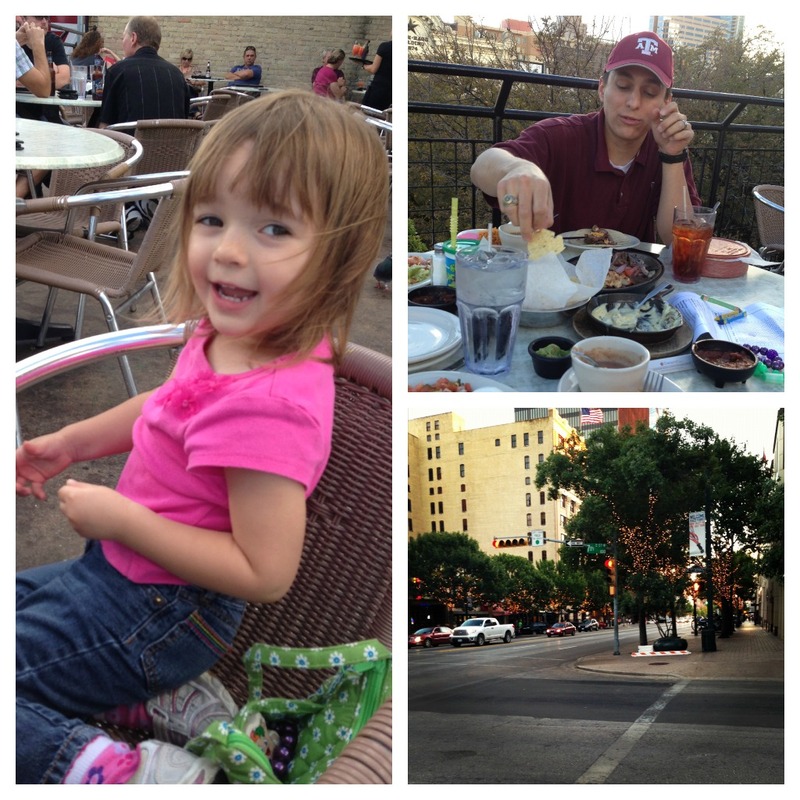 Two weekends ago we made our way to Austin for a quick overnight stay. Free weekends are hard to come by with E. J. 's work schedule and life in between, so when we had a weekend open to celebrate E. J. 's 30th (which happened in September) and our fifth anniversary, we jumped on it. Austin is one of my favorite cities. It's filled to the brim with lots of awesomely weird (read: unique) people and has the ability to pretty much soak up all your time if you just wanted to people watch. Austin is about a two hour drive from us and it's as if you've entered into a whole different county. And I love it! It may have just been a quick 24 hour trip, but it was nice to get away together. We walked all over downtown, ate some delicious Mexican food, and enjoyed escaping reality for a bit. "I want these for Christmas". She has her mother's taste. Last Friday night, Kathryn started tugging at her ear and telling me that it hurt. Later on that night she had a 102 fever. Mind you, she has also had a cold which has basically been on and off (more on than off) since August. On Saturday (our anniversary) morning, just as E. J. was getting home from work, I was getting Kathryn ready to head to the doctor. I was also getting a cold myself, but wasn't overly worried about it. At the doctor we learned that she had a double ear infection and bronchitis (her third ear infection in three months, also the third ear infection she's ever had). Keep in mind, we were at the doctor the prior Saturday (before we left for Austin) because Kathryn was throwing up the night before. I haven't even bothered to add up the co-pays and prescription costs in the past four months because I'd prefer not to know. But on the upside, the pharmacist now knows me by name, so that's nice, right? Once we got the new round of antibiotics we headed home for a quiet afternoon. 'Quiet' mainly so we didn't wake E. J. In order to make our day somewhat special, I made some yummy southwest tilapia and E. J. 's favorite, pineapple upside down. We ate our dinner like we were celebrating our 60th anniversary - at 5pm. Why so early? Well, right after dinner E. J. had to get ready for work and then head out for the night. Once E. J. was out the door to work, I got Kathryn ready for bed and after she fell asleep, I decided it would be a good time to run the self-cleaner on the oven. About a minute after I started it, the digital screen told me there was an error and the door lock wouldn't unlock. Great. Long story short, $300 later, the oven will be fixed on Monday. A week without an oven has made this baking-loving girl go a little crazy. Despite the oven costasphe, I continued the 'celebrating' with a lovely glass of hot tea with honey, OJ, vitamins, and NyQuil. For two weeks leading up to this night, I had this headache that just would not go away and then I got this cold. But, when my cold went away this week and the headache got worse and worse, I finally made myself go to the doctor. The doctor assured me there was nothing wrong other than a sinus infection. Who would have thought a sinus infection could hurt so badly and last 3.5 weeks. I'm talking I-can't-concentrate-because-there's-so-much-pressure-built-up-in-my-head-every-waking-moment-that-I-think-it's-going-to-explode kind of pain . Thankfully, he prescribed me some antibiotics and steroids that have worked wonders. I can finally say that I'm feeling like myself again. It's wonderful being able to go through the day without constantly thinking how badly my head hurt. I can't say that our anniversary was exactly what I hoped it would be, but this week especially has made me quite thankful for our health (after a follow-up appointment, K is being referred to an ENT specialist, so we're hoping for the best!) and how lucky we are to have each other. If that isn't enough to make you realize how lucky you are to have been married for five great years and be the parents of one special little girl, I don't know what is.